Go Italy!! That was legal....yellow card a tad extreme? Hope to see the Azzuri get some point against the pumas next week. No chance was that a yellow. The second Italian player tackling meant that Kankowski was kinda "braced" and there was no give when he got tackled. Poor, poor decision to yellow card. I think the fact that there was no reaction (fistycuffs, etc) from the SA players is telling. They didn't see any problem with it and it was an over-reaction by the ref to card. thats a whole heap of italian right there! Kankowski isnt the smallest of guys to say the least either. the yellow card maybe a little to much. del fava didn't intend to hurt him. I think it was similar to the hit on Tait yesterday. Head just connecting with Kankowski. Yellow card is a bit extreme, it wasn't high, just an awkward hit. there is no way that was a yellow card. had both arms in the tackle and brought him to ground. I'd say the only reason Del Fava isn't out cold is because of the head gear hes wearing. Just bad luck for a promising loosie. not a yellow card but was a dagerous tackle...tacklers should no to keep there heads in right position...and without his srucmcap it could have been alot worse for both players. but still no yellow card maybe jus penalty. the carding was a little extreme. A penalty would've been enough. Just bad luck. Tanora is right, look at the SA players' reactions. None. Fine tackle, not even high. Yellow car is too much i think. It wasn't a high tackle but just a shoulder charge, the italian player hit his head with the South African like All Blacks England in the second test. Yeah I agree with everyone, Kankowski just decided to run at the wrong guy and at the wrong time and ended up getting his body position all wrong whilst getting smashed by someone bigger and stronger than him (which is a rarity tbh). Del Fava was defo hard done by but didn't seem to complain much, maybe he's just a good guy? Maybe not, He was once banned for ten weeks for rucking someone on the head whilst playing for parma. Maybe he is just used to being sent off lol. Didn't thibk it was a foul. Kankowski a weed? you off your rocker Rugby bets? Did U not see how he bounced Richie McCaw and two of his other forwards when he scored against the crusaders; I say he ran into a big player at a bad angle. And even though I think The Yellow card might not necessarily have been justified there was no intent to use arms in that tackle. Well it looked like a shoulder charge to me - that back arm came in as an after thought...and if Butch James had tackled like that he would have been sent off to. It is the responsiblity of the tackler to make sure that the tackled player lands safely...what did fava do ...but toss him over again after he was knocked out cold! The ref was in the best possible place he could have been to see it, so I would trust his decision on this occasion. For those saying that the South Africans didnt react, the ref blew straight; they hardly had an opportunity to lose their tempers at the collision. The tackle was probably a bit sloppy, definitely no intent to cause harm. Er, there's nothing wrong with that. Ref got it wrong. I thought the tackle on Tait was very borderline but gave the defender the benefit of the doubt, this however is perfectly legal and just a clash of heads which will happen every so often if you're playing rugby. 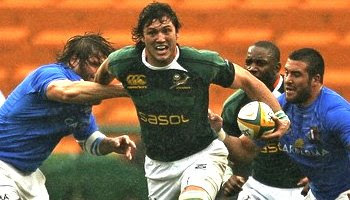 How was that a shoulder charge, he pretty much lowered the bok to the ground. Just an unlucky clash of heads like the Tait incident below. Great tackle by the second row. Nothing wrong with that legally. Defo no shoulder charge watch his right arm. im pretty disappointed with some of the comments saying that the refs are biased. on this occasion the ref was from ireland, not anywhere in the SH. im south african and agree it shouldnt have been a yellow but thats the way it goes sometimesand it goes both ways. i think that some welsh supporters should just get over it, you lost now move on - you ve got a great team which is more than shane williams. Obviously not a shoulder charge, simply a referee making a bad decision by reacting to the crowd. No way was that shoulder charge it was more the headclash that knocked him out similar to Kahui accidently clashing with Tait. pure head clash and a great tackle, should not have even been a penalty.